Configuration for Spring 5 Web MVC using a Java class and annotations. Spring Context and Spring ORM. Java dependency injection as per JSR-330. Java Standard Tag Library (JSTL) for using JSP tags for common web application functionality. Apache Commons FileUpload for including file upload capabilities. Bootstrap for flexible HTML, CSS and JS to support common UI components and interactions. Unit testing with the JUnit framework. Logging with the log4j framework. tomcat7-maven-plugin for running web applications with Maven. maven-failsafe-plugin for running integration tests during a Maven build. For this example, the Eclipse Java EE IDE (Neon version 3) is used. If needed, refer to the post below on how to setup an integrated development environment with Eclipse Neon and Apache Tomcat. 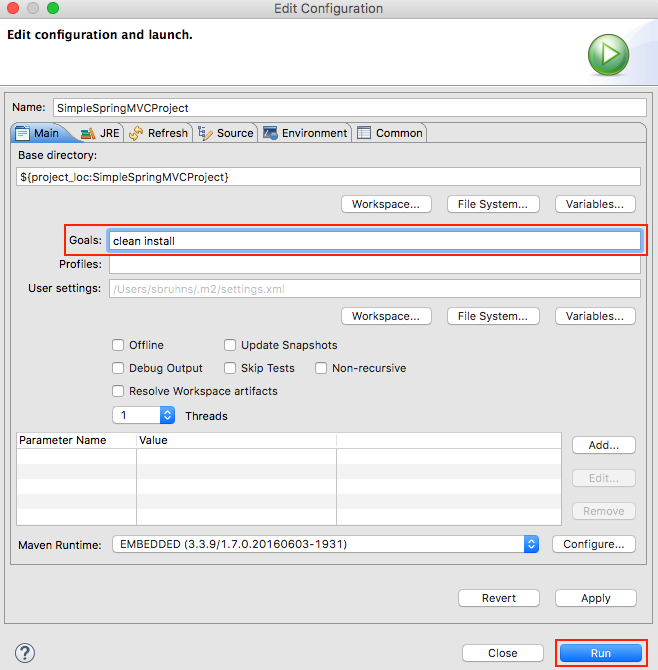 Launch the Eclipse Neon IDE and use the main menu to navigate to Eclipse > Preferences > Maven > Installations to confirm that the EMBEDDED distribution is available and checked as shown below. Maven will use a file called settings.xml which by default it tries to locate at %Home%/.m2. If the file does not exist, Maven will use default settings. Below is a basic sample settings.xml file. | The default local repository is set to %HOME%\.m2\repository. | Maven prompts you when it needs input. If false, Maven will use sensible defaults. If needed, use the proxy setting to specify a proxy server and authentication credentials that will be used by Maven when creating new projects from archetypes and during dependency resolution. 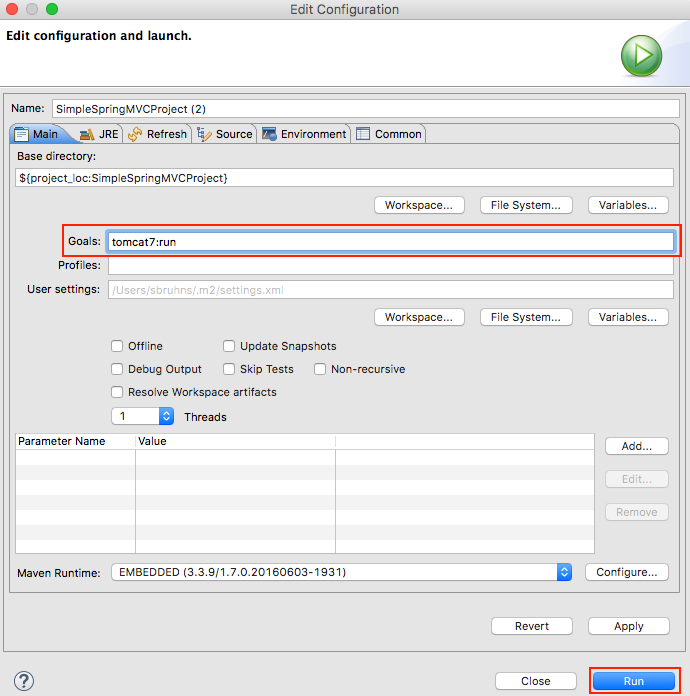 If behind a proxy, it may also be necessary to configure proxy settings for Eclipse using Preferences > General > Network Connections. 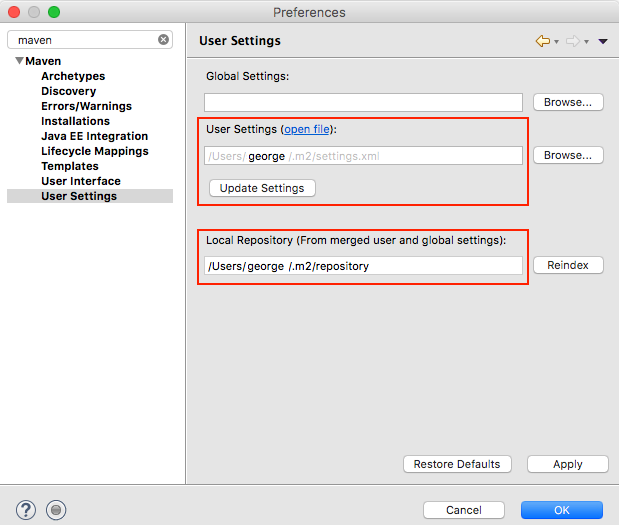 These proxy settings are used by Eclipse –not Maven– when e.g. 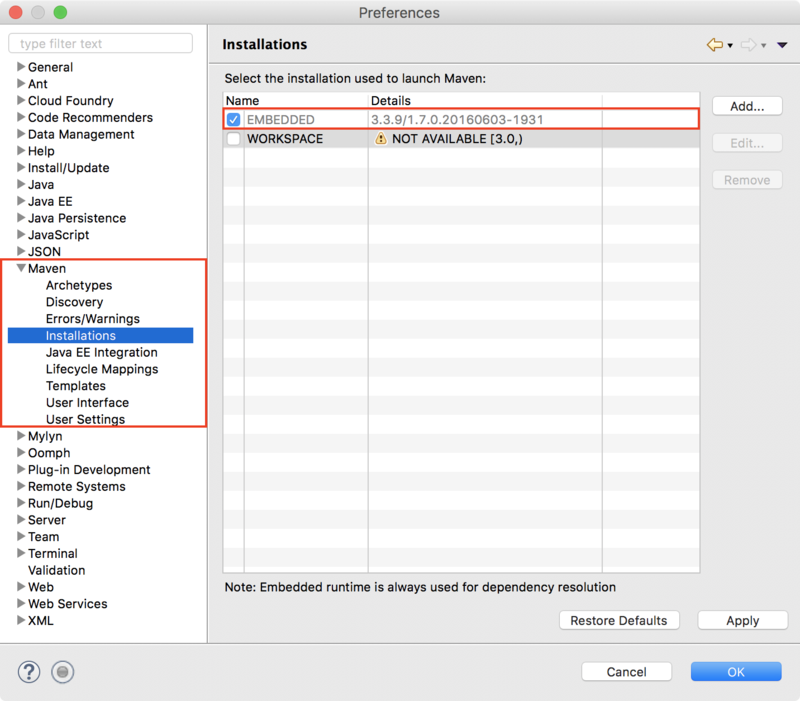 installing and updating plugins from the Eclipse Marketplace or when downloading Maven archetypes during project setup. If proxy related issues with Maven or Eclipse persist, please see stackoverflow.com/questions/25760961 for additional information on this topic. 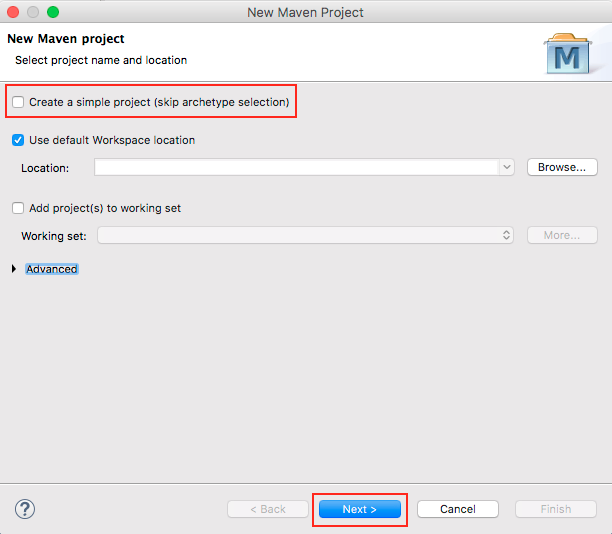 In Eclipse Neon, navigate to File > New > Maven Project to create a new project from a Maven Archetype. Click on Next on the first step in the New Maven Project wizard screen. Make sure that the option Create a simple project (skip archetype selection) is NOT checked. 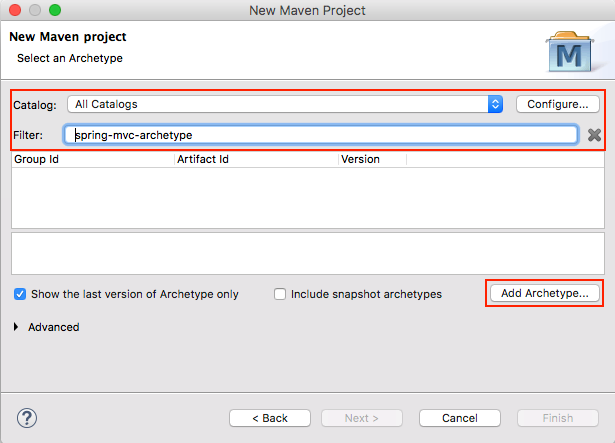 The Select an Archetype step is the most important one here, as it allows the selection of an existing archetype for the creation of a new Maven project. The archetype will automatically configure the project so that it supports the Spring MVC framework. Change the Catalog dropdown to All Catalogs. The archetype that is used here is called spring-mvc-archetype. Enter the name into the Filter box. If the archetype does not show up in the list, click on the Add Archetype button. Archetype information can be found on the Maven Central Repository. Click on OK to continue. It should then show up in the list of selectable archetypes. Select the archetype artifact from the list and click on Next. 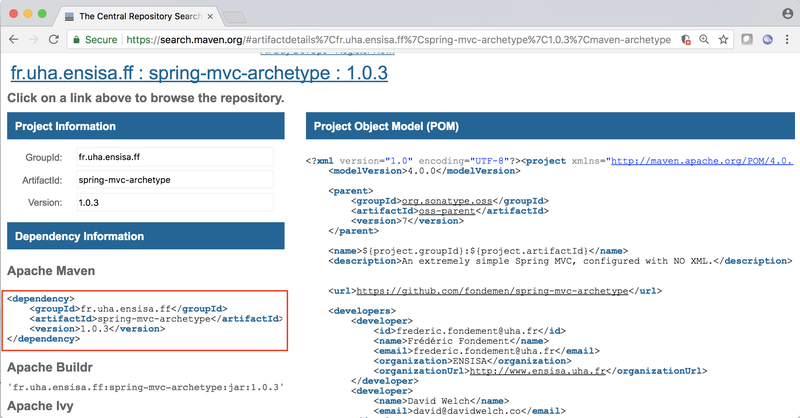 On the Specify Archetype parameters screen, enter the Artificat Id of the new project Maven should create based on the archetype. Here, the project name is SimpleSpringMVCProject. Then click on Finish. 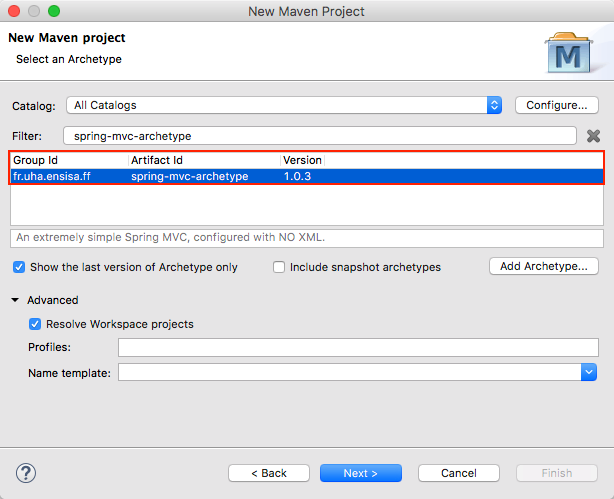 Maven will now run and setup the Spring Web MVC project according to the specified archetype. This process includes downloading all dependencies and adding them to the local Maven repository. The output in the Maven console should be similar to what is shown in the screen shot below. 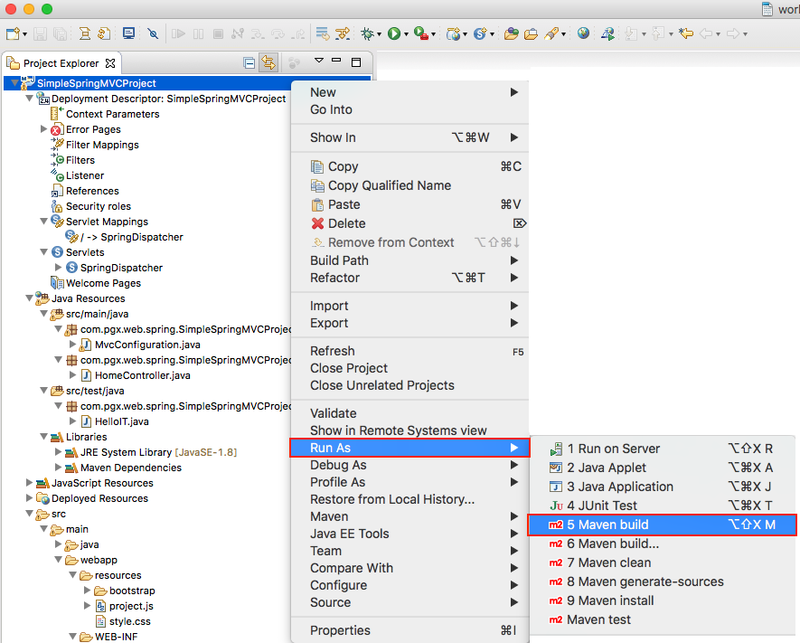 After Maven has created the project, its structure and files can be viewed in the Eclipse Project Explorer. Expand the node Libraries > Maven Dependencies to view the Spring 5 and other JAR files that have been downloaded and added to the local repository. The location of a JAR in the repository is determined by its group Id, artifact Id and version. 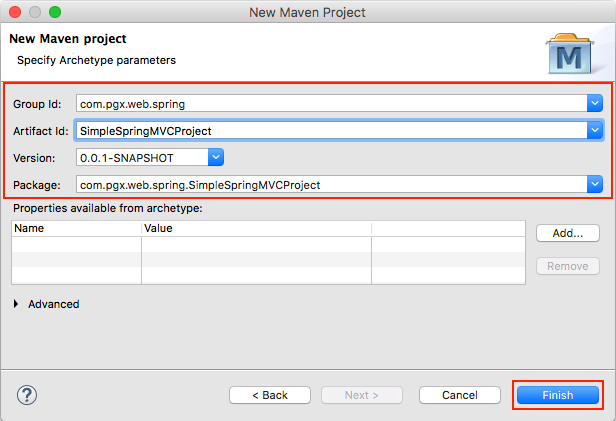 At this point, the Spring Web MVC project can be built with Maven. To run a Maven build from within Eclipse Neon, right-click on the project and select Run As > Maven build. Enter the Maven build goals, here clean install and click on Run. After a successful build, Maven will copy the generated WAR file into the local repository. The location is based on the group Id, artifact Id and version. 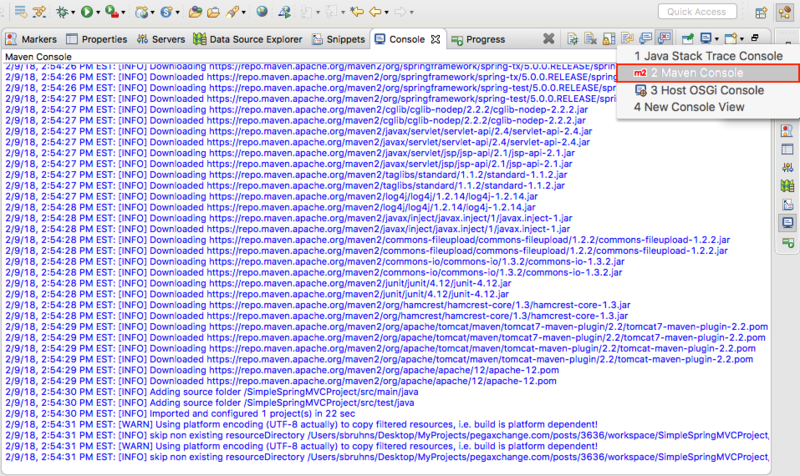 The output from the Maven build is shown in the Eclipse console. During the Maven build –after successful compilation– test cases are executed. This archetype includes one integration test case that validates a Servlet by making an HTTP request. The code of HelloIT.java is shown below. If there are test case failures, the Maven Failsafe Plugin generates a report at target/failsafe-reports. 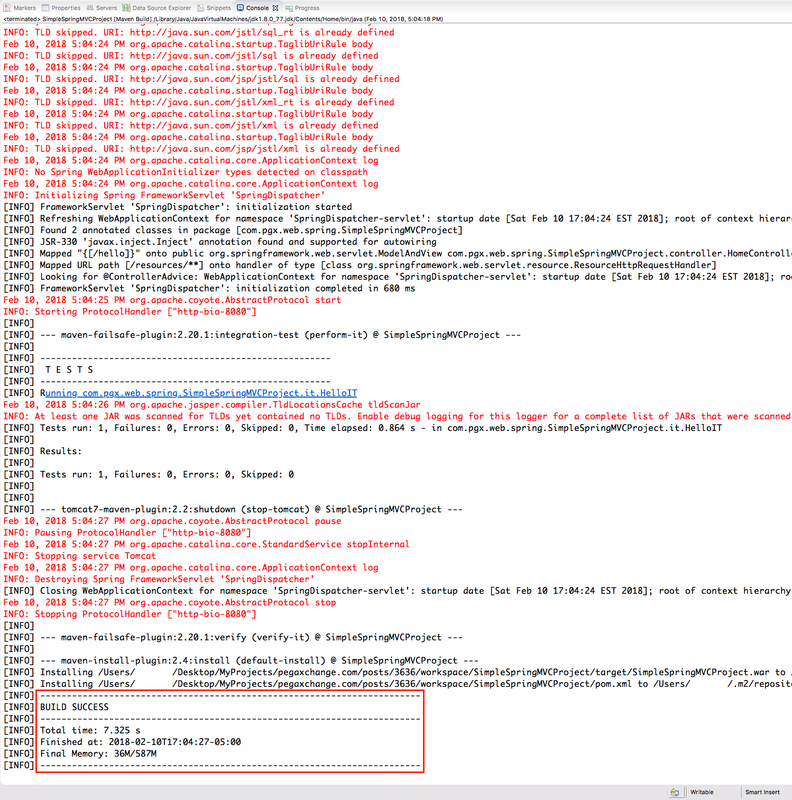 The text files in the list contain error information such as logs and stack traces for debugging test case failures. For this example, Maven is used to deploy and run the WAR file on an embedded Tomcat 7 instance. The tomcat7-maven-plugin (see line 43 in pom.xml file) is part of the archetype definition and allows Maven to run web applications on Tomcat. See the plugin’s support page for more information. Maven will start Tomcat 7 and deploy the generated WAR file. The Maven console will show that the embedded Tomcat 7 instance has been started. It also shows the Spring Web MVC view- and resource mappings. The home.jsp is part of the archetype definition. This file is located at WEB-INF/views of the Eclipse project. 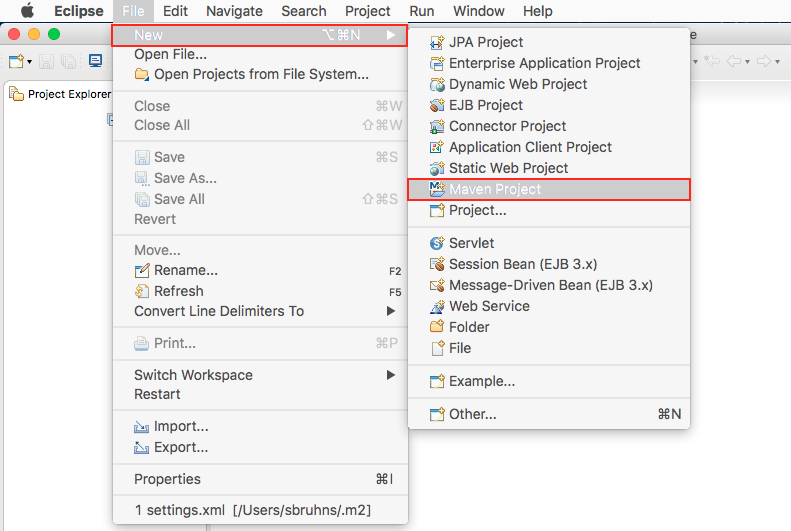 The JSP file uses a template that is based on the file template.tag which is located at WEB-INF/tags. The view controller Java class HomeController is shown below. It is located in the com.pxg.web.spring package which was specified during the Maven project setup. It adds a String parameter called name to the model. If the parameter is not present in the query string of the request, it defaults to "World". See line 12 in the source code below. Refer to the Spring Web MVC documentation for details on the annotations in this class and for XML configuration equivalents.